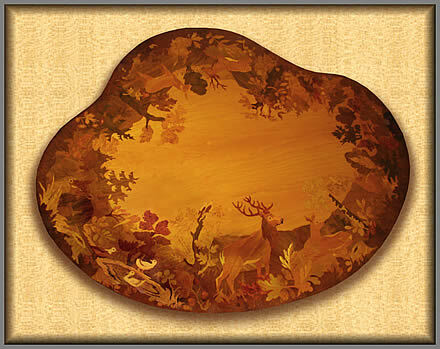 November, brings us some photos of the coffe table set mentioned in Mrs. "O's" story last month. These are the special tables made personally by Mr. Buchschmid himself in gratitude for the help Mrs. O gave him in the rescue of his stock. 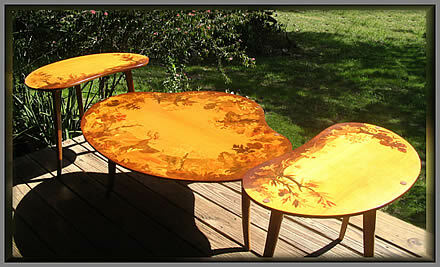 We will bring you some more photos of these coffee tables with our December update. Below these photos is a very important addition to the Buchschmid & Gretaux story; it is the personal recollections of no other than Mr. Otto Chlup himself. Otto is the third arm of the triumvirate that made up the Buchschmid & Gretaux Wood Inlay Company and ABC Studios. Otto's memories are obviously the definitive narrative where information concerning the B & G Company are concerned, so, scroll down the page for the true story of the B & G Wood Inlay Company. November's updates are very special indeed in the history and present day knowledge of the Buchschmid and Gretaux Wood Inlay Company. Not only have we got for you several photos of those very important tables that Mr. Buchschmid made personally for Mrs. "O" (as featured in the story on the previous page), we also have the "Buchschmid & Gretaux Wood Inlay Company and ABC Studios true story" as written by no other than Mr. Otto Chlup himself! 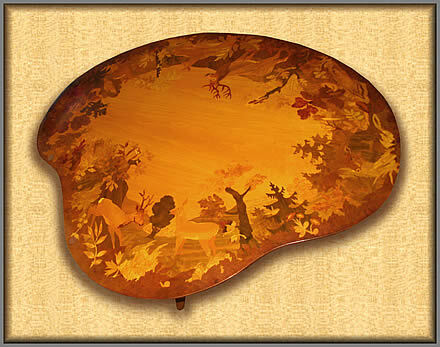 Otto's stories and his recollections of the Buchschmid and Gretaux Wood Inlay Company including its association with ABC Studios are, without doubt, the definitive narrative on the history of the company. He was, along with Mr. Buchschmid and Mr. Gretaux, the immensely important third arm of the triumvirate that produced all those wonderful BG wood inlay works during the latter half of the twentieth century. Otto himself, still maintains a very active interest in the history of the Buchschmid and Gretaux Wood Inlay Company and ABC Studios. He is currently helping us in our researches on the subject with his obvious and highly valuable prodigious knowledge of the B & G Company and ABC Studios. Otto tells us that a few years ago the German Government acquired and incorporated the Buchschmid and Gretaux Wood Inlay Company's main workshop into the State Museum at Mannheim in the section covering the subject of 'Bygone Art'. Apparently at this moment in time, the workshop's setting is still being finalised, but once it is completed, this should be a very unique and interesting insight into the working practices and artistry of the Buchschmid and Gretaux Wood Inlay Company at the height of its powers. As many of you probably know, ABC Studios and their workshops distributed and looked after the well-being of the B & G inlaid pictures and furniture. This important position naturally gave ABC Studios unique knowledge as to the best ways of caring for those wonderful B & G products. We asked Otto's opinion on the best ways to look after, care for and protect the now aging Buchschmid and Gretaux wood inlay pieces. Otto said that the conservation recommendations we give in these pages are definitely the best methods to follow when looking after you own B & G wood inlay pieces. But he said that any repair work to the varnish finish or veneer damage of any kind should be left to a professional, it is not a job for the amateur to attempt. As we previously recommended , any form of cracking (otherwise known as craquelure) found in a wood inlay piece is best resolved by placing a small container of water in the near vicinity of the afflicted piece. The small amount of evaporation that will be produced by the water will be enough to provide sufficient moisture to rehydrate the arid, or dried out, piece and help restore the distressed piece back to a correct condition for a wood inlay piece of its antiquety. Central heating drying out the wood is usually the culprit to blame here. 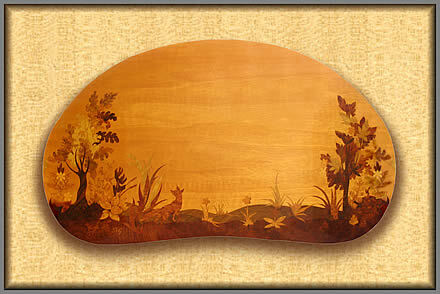 Another important recommendation of Otto's is to avoid hanging or placing your B & G Wood Inlay piece in direct sunlight. The ultra violet light in the sunlight has an unfortunate, but completely natural, bleaching effect on the colours in the veneers and varnish. You will particularly notice that the contrast of the various veneers in the inlaid picture somehow seems to have faded over the years. What may have seemed striking when you first acquired the piece may now seem somewhat dimmed. You may have thought that it was just you becoming "use" to the piece and that it was probably always like that, but in fact, it is more than likely that sunlight has actually faded the natural pigment in the veneer. It has to be borne in mind that the colour pigment found in veneers is all of organic origin, there is no synthesised colour here; except maybe for harewoods which are darkened by soaking them in a weak iron (or ferrous) sulphate solution for a short period. Most, if not all, of the Buchschmid and Gretaux works use their veneers in a completely natural condition, so the above warning should be carefully considered when placing or siting your Buchschmid and Gretaux piece. We believe that certain wax polishes containing UV blockers or filters are available these days, but as we haven't tried using these ourselves we cannot obviously give you any endorsments as to their use, so, if you wish to try them, the choice is all yours. But bear in mind that you will be experimenting on your own behalf, we have no idea or knowledge as to their reaction with, or on, the original varnish. If you do wish to experiment, test it out first by applying a little of the wax polish to an unseen area underneath or on the back of the item and leave it for several weeks to see if there are any adverse reactions before you consider applying it to the main picture area. If you have any questions for Otto, just click on the enquiry button on the right (or use the e-mail address below) and send your query in to us in the usual way, thank you. ABC Studios ceased trading a few years after the demise of the Buchschmid and Gretaux Wood Inlay Company. It does not exist anymore. 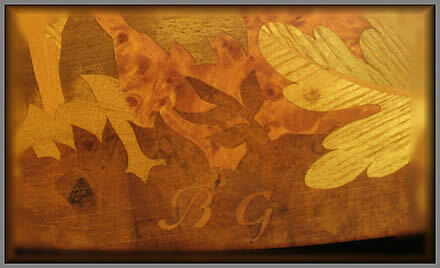 It must be more than fifty years ago now, when ABC Studios took on the responsibilities of becoming authorised agents for the Buchschmid and Gretaux Wood Inlay Company, and for displaying and distributing Buchschmid and Gretaux inlaid art works at exhibitions in the USA and various German locations. 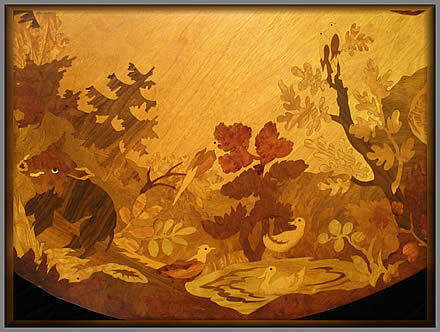 Mr Gretaux and myself (Otto Chlup) created and made the artistic designs for the inlaid pieces. In those early days we did many special orders for our growing clientele, some of particular note are, for instance, a wall-plaque of the FBI design/logo specially cut for Mr. Hoover at Langleys Office; various wall plaques for the Boy Scout organization; and a special “astronaut design” serving tray which was presented in Bitburg, Germany to US Pilot “Chuck” Yeager who was the first person to break the sound barrier. Our association with our American friends more or less began around fifty years ago with a phone call to Mr Gretaux from an American family who were now living in Wiesbaden, Germany and had acquired some furniture for their home. One of the pieces they had acquired was a rather shabby secretaire or escritoire (which is a writing desk with drawers) and on inspecting it they discovered two hidden compartments with the B & G initials displayed on the reverse. The family were intrigued by the hidden drawers in the desk and eventually managed to track down Mr Gretaux (hence the phone call previously mentioned) and offered to return the piece to him. And so it was, that on a bleak and stormy night and in a hastily borrowed automobile, we (that being my friend and neigbour Ernest Bernauer and myself) drove the many miles there and collected this poor old, somewhat beaten up, secretaire. Over the next few years Mr Gretaux restored the writing desk to its original glory and eventually presented it to my new wife and myself on the occasion of our wedding, a superb gift indeed. The warm hearted generosity and helpfulness of our American friends ensured our connection and association with each other and was therefore, hence forth, destined to become very tightly intertwined indeed over the ensuing years. Somewhat later, and in consideration of my age, I was selected for the duties of staging exhibitions in the US Bases here in Germany, while Dr. Heuvels became our travelling representative visiting, mostly by air, many US establishments and bases outside of Germany. I daresay that many of you ex-service people will remember Dr. Heuvels well, he was a very friendly fellow and most helpful to those who knew him. Just to finish, you may be interested to know what the ‘ABC’ in ABC Studios stood for, well, it works as follows: A = Artist, B = Buchschmid (and at the beginning; Bernauer), C = Chlup. Best of Greetings and Good Luck to you all. Click the above button to return to page 13 of "Can You Help"
Click the above button to visit page 15 of "Can You Help"